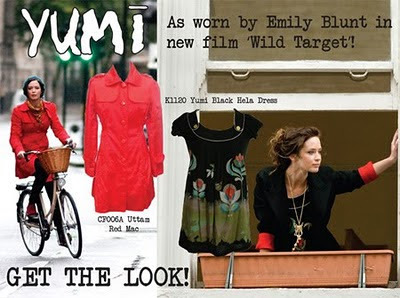 I saw a great film on a flight recently, called Wild Target and starring Emily Blunt and Bill Nighy. It's a comedy about a con artist and a hitman but there is a brilliant Cycle Chic sequence where Blunt's character rides a lovely bicycle in a smashing ensemble. I found the photo of her, above, on this website. Our reader Yvette sent us the link to this trailer for a new Canadian indiefilm that also features bicycles in cracking Cycle Chic style. Another great film that features bicycles is the Canadian film Monkey Warfare, which we blogged about last year. Remember: Bike is the new black. Bicyling magazine recently named "Pee Wee's Great Adventure" as the greatest bicycling movie of all time. The story also has a link to a slideshow of the also-rans. I prefer your list, Mikael. That outfit on Emily Blunt is fantastic. The magazine's list contains 7 bike racing movies (not the same thing), one kids' movie, and only two with any real cycle chic content. For shame, spandexers! Ron Sexsmith made a cameo! I must see this film! Again, the type of perfect red hot coat I've been searching for for two years. This winter it's my mission to find one for real. Looks so great on a bike.